Getting a new iPhone or iPad device can be incredibly exciting. As soon as you get it, you want to play with it and customize it as much as possible, to reflect yourself. For those of us who are more likely to purchase a used iPad or iPhone, you may feel this way even more so. The trouble is, with used devices, you may have more trouble with certain apps, like the iCloud for example. In most cases, you can ask the seller to unlock the iCloud on your new used device. But in other cases, sellers may intentionally keep the iCloud locked on the sold device, essentially leaving you with a useless phone, or iPad. With the iCloud locked, you cannot make calls, send texts, or anything of the sort. It can be a real pain, no doubt! As I have previously stated before, there are sellers out there who will intentionally keep their iCloud locked, as a means to hustle you out of your money. When you realize that you have been duped, they will either deny your request to unlock the device, or ignore you completely. Which is incredibly rude, right? 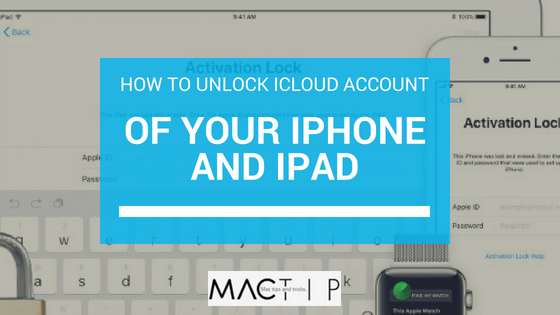 Therefore, it is very important to check the used device before making a purchase, because there is no way for a normal user to get around the iCloud Activation Lock. As it turns out, the only possible way that you can unlock your device, for free of charge, is if the seller is willing to unlock the device. Please do not misunderstand, there are some sellers who will work with you. However, this is not always the case, so you have to remain vigilant. There are a multitude of companies that provide services to unlock your device. However, they will charge you a ludicrous amount of money just to unlock your device, however these services seem hardly worth it. Companies like this sometimes even charge more than what you originally paid for the device! Thankfully, despite the unreasonably priced companies there is one company that will provide this service for a considerably cheaper price, and at a much faster rate than other companies; the company is called “OfficialiPhoneUnlock.” Here is a step-by-step guide to get your phone unlocked. The very first step is to visit the OfficialPhoneUnlock website. This website is easy to navigate, and provides a quality support system, just in case you have trouble with anything. You will also find reviews towards the bottom of the page, just in case you are uncertain about the process. In the sidebar menu, you will see an option for the iCloud Unlock option, if you do not go straight there from the provided link. Select this option, and it will take you to the proper page. 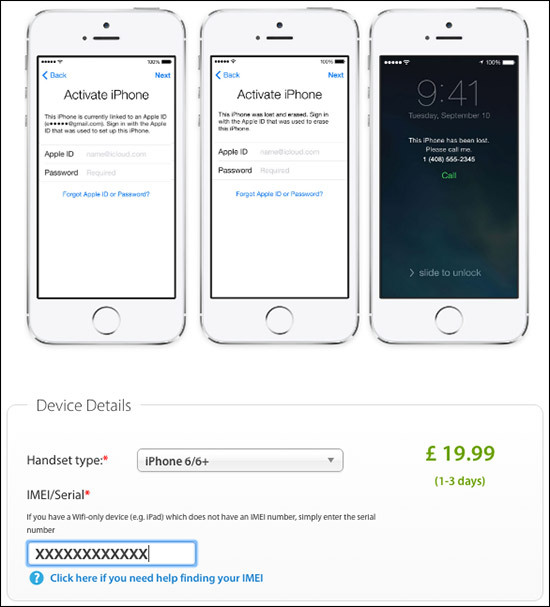 Towards the bottom of the page, just before you see the reviews, you will see an option to select your device model, and a text box that asks for the IMEI, or Serial number of your phone, or iPad. If, for whatever reason, you do not know your IMEI number, you can dial *#06# and you will be able to receive your IMEI number. Or (because if you are reading this, then the chances are that your phone is locked and you do not possess the capabilities to dial the previously mentioned number), when you look at your iPhone or iPad screen, you can click on the “I” that should be in the display. Once you click on that “I,” you should be able to see your IMEI number. After you have entered all of this information, you will be prompted to make your payment. It will cost between $24 – 48 (or £19.99 – 39.99, if you are not in the states). This is comparably cheaper than what other companies are charging for this exact service. The last step is to patiently wait for the company to handle the situation. It will not take too long. They take, at max, a couple of days to get your device locked. Once the device is unlocked, you will be able to fully enjoy your device to the fullest! I regret to inform you that there is no free solution to the problem, if you cannot get the seller to unlock the device. Now, if you are like me and do not want to spend the extra money to get your device unlocked, it may be a better idea for you to simply save up and purchase a new device, rather than buying a used one. This way, you will not have to go through this struggle. I, personally, would do this because I think it’s a hassle. I hope that this walk-through helps, and that you are able to enjoy your iPad or iPhone! How to Fix A “Cannot Delete Backup” iCloud Error?